The 23rd Amendment is about the Presidential vote being given to Washington, D. C.
Summary: The 23rd Amendment was ratified in 1961, during the administration of JFK, giving the people in the District of Columbia the right to vote for President. When was the 23rd Amendment passed? Amendment XXIII was passed by Congress on June 16, 1960 and was ratified on March 29, 1961. 23rd Amendment - Presidential vote given to Washington, D. C.
John F Kennedy was the 35th President of the United States whose presidency spanned from January 20,1961 to November 22, 1963. One of the key events during his presidency was the ratification of the 23rd Amendment to the Constitution. The cause or reason for this addition to the Constitution was to address the problem of the residents of the capitol not having any political voice in federal government. Explanation & Meaning: The capital city (the District of Columbia) will have the right to vote for President and Vice President, as other electors. They will have the number of electors that they would be entitled to if the district were a state - but this number will not be more than the state with the least number of people. The electors shall be in addition to the states electors, and will be counted for the purposes of electing a president and vice president. They shall meet and vote as detailed in the 12th amendment. Congress will decide how the electors are chosen. The above information provides the text, definition and summary of the amendment. 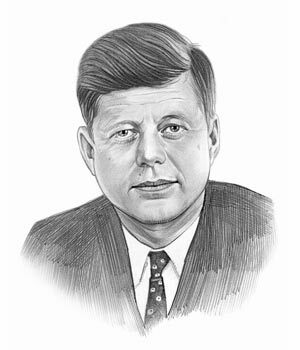 The following John F Kennedy video will give you additional important facts and dates about both the personal life and political life of the 35th President of the United States whose presidency spanned from January 20,1961 to November 22, 1963.